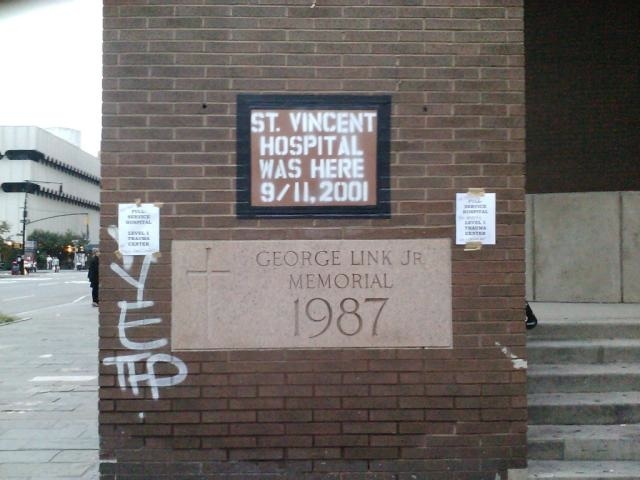 It’s true: St. Vincent’s, a level 1 trauma center, was there on 9/11/01, and there to serve Greenwich Village and the lower west side ever since it was founded in 1849. In the 1980s it was “ground zero” (along with San Francisco) of the HIV-AIDS epidemic and developed an acclaimed multi-faceted HIV-AIDS treatment program. Closer to home, it was where yours truly got her shoulder mended! Read more about its illustrious history and tragic demise here. 91011, the zip code covers the area of La Cañada Flintridge in California; read about the area here. And the day also seems to be a very popular wedding date; read all about it in this article in the Sioux City Journal! Speaking of September weddings, happy early one-year anniversary to Arcadia and Rodney, wed 9/25/2010 — a very good day! There’s quite a lot of activity going on these days at the ol’ homestead, and of a decidedly centrifugal variety! (Etymological note: centrifugal is away from the center, from centri = center and fugal = fleeing, whence fugitive. Centripetal is toward the center, from centri = center and petal = seeking.) While cartloads of items have “flown” to the Goodwill, to booksellers of various sorts, and to rummage sale stockpiles, a good hoard of items have been swept up into the continued care and keeping by members of the Boomerang readership, to whom this particular find may be of particular interest: a photo of the Original Boomerang editor, Fred Eno! Here he is along with the person he refers to as “Mama” in the Original Boomerang (but whose real name was Mary Miranda, née Loper) in year uncertain. 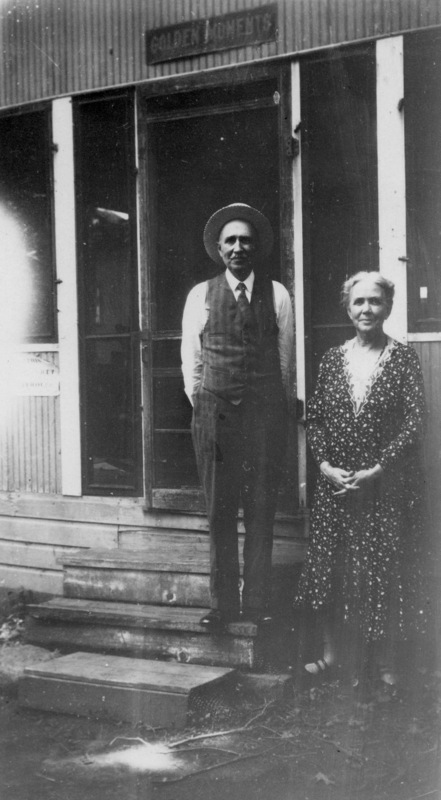 The back of the photo has a note, “Grandfather and Grandmother Eno at Clear Lake Cottage” and the number “65” (hmm!). If you click on the photo so that you can see its full size, you’ll see that the sign above the door in the background reads “Golden Moments” — indeed! During a speech he gave at the annual anniversary dinner of the church (the big event of each year) he became very excited (or pretended to) and took off his suit coat, then his necktie, then his vest and then his shirt. To the delight of some of the audience and very shocking to others, he had on a corset — the kind that laced up the back with long corset strings. The thrust of all this had something to do with his not being tied to any one’s strings — they were his. The Ad Club was the fore-runner of the Chamber of Commerce. Dad was very active in the Des Moines chapter. One of the annual dinners was held in a hotel across the street from Dad’s printing company. After Mother and Ruth and I were seated for the dinner Dad excused himself to take care of some business at his shop. Just as it was his turn to appear on the after dinner program the door flew open and in came a newsboy, yelling “Wextra, Wextra, read all about it.” The newsy was Dad, dressed in knickers, with a cap on and the Extra newspaper he was peddling was his speech which he had written in newspaper format and had printed. He gave a copy to each of the guests. At another Ad Club dinner he was also absent from the table for a while. Again he made his entrance just when he was to be on the program. This time he was dressed as a printer’s devil, tail and all. He won many contests with original slogans, motto type sayings and short rhymes. NB: A “printer’s devil” = a printer’s apprentice. Folks aren’t sure about the origins of the term; it may be related to the tradition whereby an “actual” devil (named Titivilus) caused mischief in print shops–and before print shops, in scriptoria!–pulling such devilish pranks as introducing misspellings, omitted words . . . on and on! Read more about printers’ devils here. 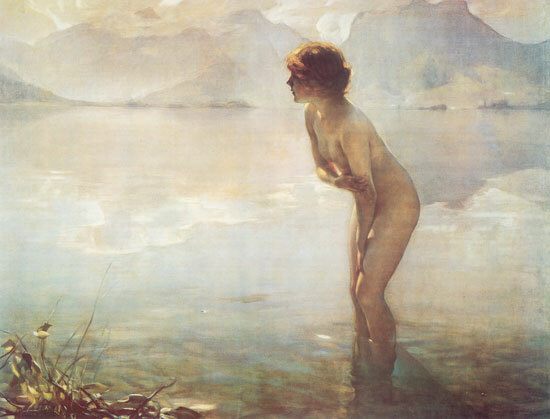 September Morn is a painting by french artist Paul Emile Chabas and was completed in 1912. It was somewhat of a sensation/scandal in the US. A digital copy appears below; read more about the painting here.